Within the framework of these descriptions, each instructor brings to class their own unique yoga training and point of view. Classroom temperatures, music/silence, pacing, and teaching techniques will vary with each instructor. All Levels Flow: This is a multi-level class designed to welcome most practitioners. This class is a journey – creating a fluid asana experience from opening to closing. Arm balances and inversions are taught at an approachable pace with instruction and modifications. Physically challenging, yet accessible, All Levels Flow builds strength and suppleness, and students tap into yoga’s transformational power. 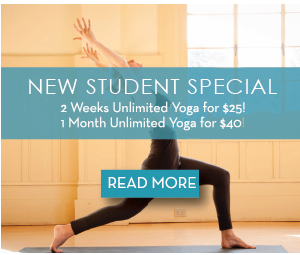 Optimal for those with knowledge of the basics of yoga. Some all-level classes include meditation. Ashtanga Half Primary: This class is for beginning to intermediate students. Foundations of the Primary Series will be emphasized, along with modifications for poses as needed. This led class is a good place to begin or to deepen an Ashtanga practice. Ashtanga is a traditional method of yoga, offering a particular group of postures in a specific sequence, as practiced by Sri K. Pattabhi Jois. This vigorous, rhythmic, breath-centered vinyasa practice strengthens, purifies, and aligns the body both physically and energetically. Ashtanga Yoga: A traditional method of yoga, Ashtanga Yoga offers a particular group of postures in a specific sequence, as practiced by Sri K. Pattabhi Jois. There are six Ashtanga series in all; the first is the Primary Series: a flowing, rhythmic, breath-centered vinyasa practice that strengthens, purifies, and aligns the body both physically and energetically. It is very athletic in nature, building arm and core strength. Ashtanga is normally taught in two forms: “led” (a group class moving together), and “Mysore style” (practiced individually in the same room under the guidance of a teacher, as it was taught by Mr. Jois in the south Indian city of Mysore). Dragonfly will be offering “led” classes to introduce the Primary Series to our yoga community. This class is appropriate for those with a consistent vinyasa or power yoga practice. Unlike some Ashtanga classes, Laurie, Lucas and Stephanie will offer modifications and props when helpful. The postures (asanas) will be taught progressively, and the series will be edited for length when necessary. As students grow in technique and stamina, more postures will be added. Deep Slow Flow: This class is designed to challenge, engage, and to find your release through a series of standing/seated postures guided at a much slower pace. This class will allow you to expand and explore the postures, find your edge, engage muscles, build flexibility, linger, and then relax into a deep space – finishing with meditation. Reactivate your practice, your body, your mind and spirit. All levels welcome. Some experience with vinyasa flow yoga recommended. Flow Level 1/2: Establish a solid foundation for your yoga practice in this class. Foundations of Flow focuses on the primary asanas of hatha yoga, and builds from the framework of Sun Salutations (Surya Namaskar). Learn the components of breath work, the common transitions of vinyasa flow yoga, and how and when to modify your practice. Appropriate for all levels, those new to yoga will find its pace and instruction friendly and accessible. This class will enable you to practice intelligently, and to improve your overall health. Flow Level 2/3: This dynamic class challenges your foundational practice with more complexity in pose options and transitions. Level 2/3 incorporates stamina and strength work and often includes arm balances, inversions, backbends, and plenty of sweat. This class is appropriate for those with a solid flow yoga practice, and intermediate practitioners. Teachers will instruct and guide you with great care. Happy Hour: Heated all-level power vinyasa flow. Yogis will have a blast sweating to tunes by various artists during this hour-long class. Appropriate for those with knowledge of the basics of yoga. 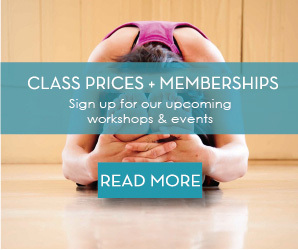 Intro to Yoga: Learn and grow in our Intro to Yoga class. Discover the primary asanas (postures) of yoga, and how to modify poses for your body. Build confidence to join other classes on the schedule. A great place to begin your yoga journey, or to review the basics. Prenatal Yoga: Prenatal Yoga is designed to alleviate the common aches, pains and conditions associated with pregnancy. In addition, this class helps build the strength, stamina, and mental clarity needed for childbirth. It’s a fun way to experience extreme self-care while bonding with a community of other expectant mothers. Restore and Release: Restorative yoga gives you a chance to slow down, feel your breath and open your body, returning to your calm, centered Self. This gentle yoga allows you to open the body with the support of props, and poses are held longer to allow for more opening and an opportunity to tune into the breath and release stress. This class will calm the central nervous system and promote healing for the body. Class is for all levels. Please dress in layers to keep yourself at a comfortable temperature. Sunrise Yoga: Sunrise Flow is a class designed to welcome most practitioners. This level 2 class is sequenced to address tight morning muscles and joints, and to build energy and focus for the day to come. Arm balances, inversions and backbends are taught at an approachable pace with plenty of instruction and modifications. Yin Yoga: Explore your inner landscape with Yin Yoga, a practice grounded in Chinese medicine and the energy meridian system. Yin yoga emphasizes breath work, slower rhythms, mostly seated postures, longer holds and deep release. Relieve your aching back, tight hips, and other urban conditions, in this mindful, meditative class.